The green smoothie…it looks so green…yet tastes so fruity. I had this for lunch the other day when I was in a rush, and I love doing it for breakfast, or sharing one as a mid-day pick me up. This smoothie has been promised to some of my personal training clients. 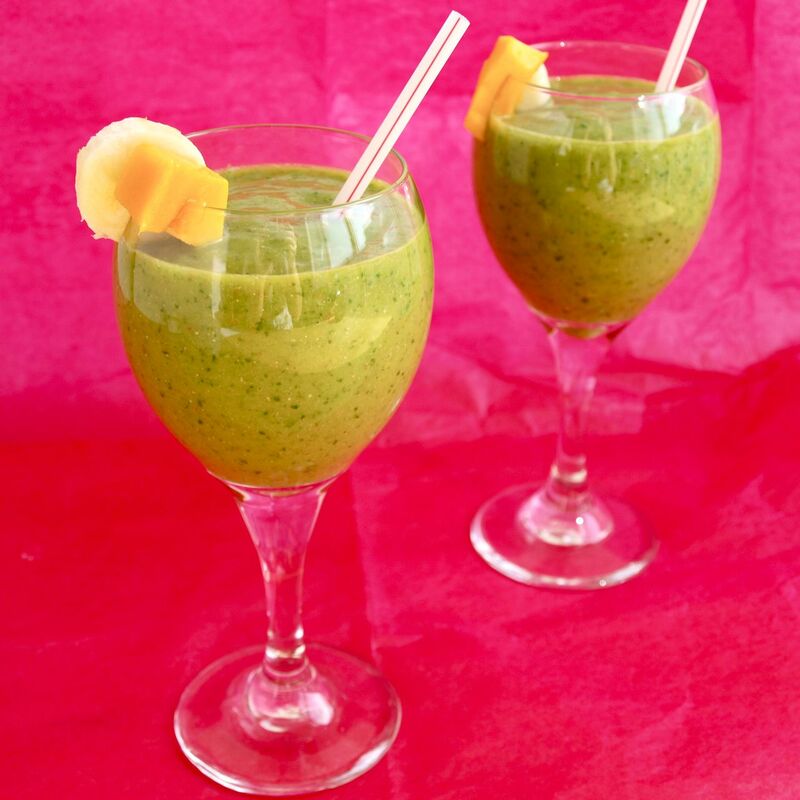 One client makes a big blender of smoothies for the whole family each morning. This would be a fantastic way to sneak some veggies into everyone’s breakfast. The only problem? The color! I told her to put it in colored or opaque cups with lids and straws so the kids don’t notice. I haven’t heard the verdict on that one yet. Lots of other people just need to sneak some more veggies in to their day, and they might as well get started with breakfast! And I swear, although I love spinach in savory dishes, I don’t necessarily want to drink it and taste it…BUT you don’t taste it in a smoothie! I promise. Blend it all–if it’s too thick, feel free to add more milk or some water. A few spoons of kefir–A great way to get some probiotics into your digestive system. Careful–kefir isn’t the same as Activia. Good yogurts have bacteria that colonizes, so it helps you more than the day you eat it. Activia yogurt isn’t colonizing, so the day you don’t eat it, you stop reaping the benefits. These good guys help crowd out the bad guys…so eat fermented dairy, and fight the good fight! Chewing actually helps to release the digestive juices you need for proper digestion, so even though you don’t need to chew a smoothie the same way you need to chew a piece of meat, you should actually try pacing yourself as you drink and mimic a bit of a chewing motion–you’ll absorb more nutrients! What’s your favorite thing to sneak into a smoothie? Come back next time…it will be my 100th post, and I’ve got some exciting news to share! I like to add sliced almonds and raw sunflower seeds to mine so that there is no mimicing any chewing. You actually get to chew the pieces that don’t get pulverized if you make it that way. You also get more enzymes if you soak those almond slices first, which makes the nutrients more accessible. Yes and if you soak the almonds overnight, you have your Almond Milk ready for your smoothie. beautiful smoothie! Love the idea about adding kefer and flax seed. Genius as usual! Congrats on the 99th post!